[Intro – Slide 1] Hello, on behalf of my teammates I’m happy to present our Zurich Enterprise Challenge submission for RoboCanada, Inc. We thank you for taking the time to consider our analysis. [Agenda – Slide 2] Here’s our agenda. We’ll start with a quick introduction to the project. Next we’ll enter the Risk Room and analyze the three countries we recommend the firm consider. [RoboCanada – Slide 3] RoboCanada wants to leverage a growth opportunity in Asia by having an assembly and distribution hub closer to its customers in Kazakhstan, Pakistan, and South Korea. Their current hubs in Canada and the United Kingdom are too far away, and this new hub will help shorten the company’s supply chain and reduce servicing times. RoboCanada’s corporate strategy aligns closely with Dr. Ghemawat’s triple-A framework. Particularly the Aggregation category, as they are attempting to mitigate risk by reaching economies of scale through international standardization. Their business principles also align with the Arbitrage category, as the company looks to diminish their risk by exploiting the advantages various countries across the world have to offer. [Zurich Risk Room – Slide 4] Here we have the 7 countries in which RoboCanada is considering opening their hub all placed on the Zurich Risk Room scale. We can immediately see Malaysia, Thailand, and China are the least risky options when political, physical, and business environment risks are all taken into account simultaneously. [China – Slide 5] First, let’s examine China. China is a major manufacturing hub. However, we have identified the following higher-than-average risks in the Zurich Risk Room that are not experienced in Canada or the United Kingdom. Exchange rate fluctuations, human rights issues, and natural disasters. Zurich’s Risk Room ranked China’s fluctuating exchange rates above the median, but hedging and raising product prices help mitigate this risk. China has a history of human rights issues, but mitigation is possible through establishing processes that identify, prevent and correct potential challenges. Compliance can also be ensured through building strong government relationships. Finally, natural disasters like storms, flooding and earthquake can halt business operations, but the firm can diminish this likelihood through smart facility design, contingency plans including backup manufacturing locations and insurance policies. [Thailand – Slide 6] Next, let’s explore Thailand. Thailand’s high-risk areas are government regulation and storms and floods. Government regulation’s influence can be lessened with active participation in government relations, well-defined exit strategies and lobbying efforts. Thailand’s storm and flood risk can be reduced similarly to China’s through smart facility design, contingency planning and insurance. [Malaysia – Slide 7] Lastly, let’s assess Malaysia. Within the risk room, its combined risk is only slightly higher than that of Canada and the United Kingdom. Human rights is the only area where Malaysia surpasses the median level. This issue stems from recent reports of forced labor and recruiting practices. If RoboCanada retains tight control on the recruitment and hiring process, continually monitors working conditions and works closely with the government and regulatory committees to ensure compliance, they can significantly lower this risk. 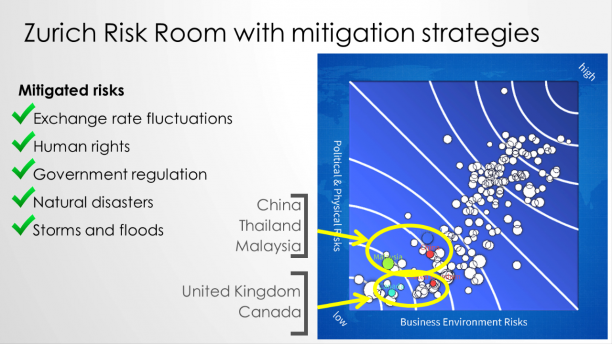 [Zurich Risk Room Update – Slide 8] While all three countries face some level of risk, mitigation is achievable. By implementing the risk mitigation strategies, any of the risks in these three countries can be reduced to a level that makes them attractive options for the new assembly and distribution center. [Agenda – Slide 9] Let’s take a quick look at what we’ve covered so far. We have introduced the topic and identified the top three countries for RoboCanada’s expansion. Now, let’s move into other important considerations and finish with a summary of the main points. [Important Considerations – Slide 10] While the Zurich Risk Room covers a broad range of both business and political risks, there are other factors that must be considered before making a final decision. One of the most important, yet often overlooked components in determining the success or failure of international business relationships is the cultural fit between headquarters, suppliers, manufacturers, and customers. Looking at the similarities and differences between the countries in Assertiveness, Collectivism, Power Distance, and High/Low Context will give a clear picture of how communication issues are likely to occur. Proximity to customers and suppliers is another factor not shown in the Zurich Risk Room. The costs and time it takes to ship from suppliers and to customers will depend heavily on the distances and modes of transportation available. China for example is higher in risk than Malaysia or Thailand but it is closer to the suppliers and customers. Each country carries different costs for wages, utilities, and other operational expenses as well as different tax incentives to offset those costs. The World’s Economic Forum ranks countries on 12 different pillars to assess their Global Competitiveness. As you can see in the chart, our three recommended countries are the top in the Asia market. Each pillar should be reviewed to determine the most important factors to the firm overall. [Summary – Slide 13] In conclusion, building an assembly and distribution hub in Asia is necessary for RoboCanada’s Arbitrage strategy of having a presence in their regional markets. Even though Malaysia, Thailand, and China all carry higher risks than RoboCanada’s current hubs - their risks are not business prohibitive and can be mitigated with proper preparation. With risk ratings reduced to a reasonable level for each country the decision turns to other factors like Culture, Location, Costs, and Competitiveness to make a final decision. Ghemawat, Pankaj. "Chapter 6" Redefining Global Strategy: Crossing Borders in a World Where Differences Still Matter. Boston, MA: Harvard Business School, 2007. N. pag. Print.